The installation process is generally straightforward (and seems to get more streamlined with each release!). First, the installer asks for a language in which to carry out the installation (and to use on the installed system) -- languages are shown in their native text (e.g. Deutsch). On my system this was selected as "English" by default. 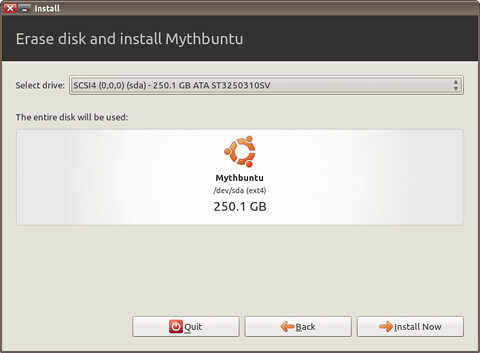 Having selected a language, the installer then checks a few things to ensure it is OK to carry on with the installation. The details of the internet connection will obviously depend on your particular setup -- in my case, I use a wireless connection and had to set this up in the live CD session before hitting 'Install' (once you get to the installation wizard, there doesn't seem to be any obvious way to create an internet connection during the process (can you tell I learnt this the hard way?!)). If using an ethernet connection there wouldn't be any issue as it would automatically be connected. 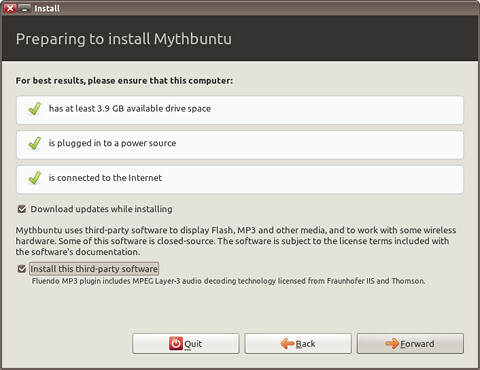 We are then asked for whether we want to install some 3rd party proprietary drivers and codecs (these deal with things like MP3 playback, some hardware, etc). This is unticked by default due to potential licensing issues in some territories. Assuming it's appropriate and legal in your area to install these, it's best to install them as they are needed for proper performance with some parts of the system (e.g. if you want to use it to play MP3s). 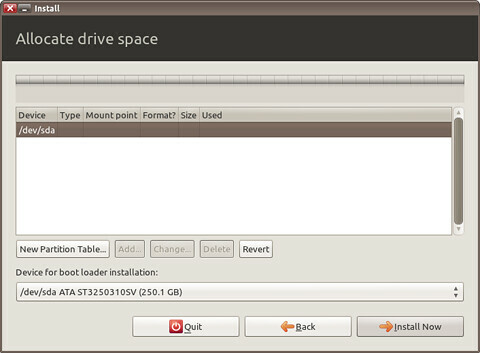 The next stage is to set up the drive space and partitions. The details of this will depend on what's already installed on your system (if anything) or if it's a fresh hard drive etc. As this was a new build, when I first did the installation, there was no existing OS so I was only given the option to 'use the whole disk' or 'something else' (which is a more advanced partitioning option that allows you to change, merge and resize partitions etc). Selecting the manual ('something else') partitioning then shows the disk(s) you have in your system and if there are no partitions on the disk already (e.g. if it's a totally new hard drive that hasn't been formatted) we have to create a new 'Partition Table' (broadly: the disk's internal record of what partitions it contains) and assign the space manually. 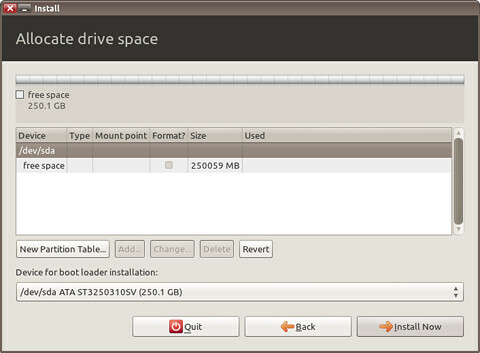 The 'free space' partition could then be changed, to give the file system (e.g. ext4) and mount point (e.g. /). 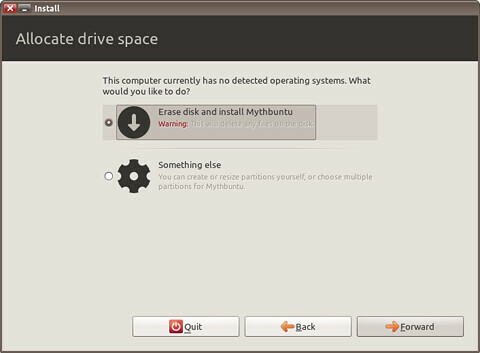 If choosing to erase the whole disk (if it contains anything) and use all the space for Mythbuntu, the installer will automatically decide what partitions to allocate based on the size of the disk. That's it! Having answered the questions above the installer will now go off and do its stuff copying the files to disk, installing updates on the way (if you chose to) and then asking for the system to be restarted once it's done. During the installation, there are a few more dialog boxes such as asking you to set your time zone, add a user account (that the media center will run under).